Thanks for the excelent app. I am testing on Android. Please let me start thanking again for the excelent accessibility support in the desktop version. Foobar 2000 is keyboard accessible on all the desktop version of Windows I know of, the playlist view features custom accessibility implementation so except of enhancing performance of super class ATL controls it not only preserves its accessibility support but making it work as good as possible. Most of the accessibility stuff has been transfered to the Android app as well. Majority of the controls are clearly labeled, however there are a few exceptions where image buttons don't have textual so called contentDescriptions. This includes Search and Tools buttons on the main window where library browser is displayed. The same can be said about lockscreen notification controls. I guess these are iconized buttons missing textual contentDescriptions. Similarly some buttons on the Tools window mainly in the Settings and the DSP manager where they are expanding more settings are lacking this textual contentDescription. These are all minor nits and I believe these can be easily addressed. If it may help, I can be more concrete here. However either I am not clever enough or there are more serious issues when showing now playing screen (the screen which shows when tapping show play controls on the Tools window). This does not appear to be standard Android window and I don't appear to be able to navigate it using built-in android screen reader Google Talkback. Can you please try to describe this screen to me a bit so I can at least find out what I might be missing? Up to now I was only able to discover a library with its multiple views and search. Is there a way to display the current playlist or multiple playlists like on the desktop version or this has been reworked to fit more with the mobile experience? Have you formed an opinion on the accessibility topic such as what I'm trying to talk about here? Is it likelly you will be able to address some of the accessibility issues in the future? Have you received some accessibility related feetback or am I the first one bringing it up? Generally speaking all three platforms, IOS, Windows and Android have built-in accessibility support, IOS and Android devices are very popular among blind users and people with other impairments I would say. If there is a way to cooperate here please do count me in. Finally I have sent a crash report. I have launched the app, realized there are no tracks in my /sdcard/music folder, I've browsed by looking at file system tree to the /sdcard/Downloads folder, started to play a single not tagged MP3 file from there. After listening for a short while I have stopped the playback by using the Stop button found on the Tools window (the Window which shows up when tapping the next button on the top to the right of the Search). When the playback was stopped from the Tools window I have attempted to inwoke a context menu and right at this point Foobar 2000 has crashed. I'm running Android 6 on an LG G3. I have a question regarding the use of UPnP Server and playing files from the Documents Folder. When playing music sent to the Documents Folder, the App only shows the filename. No artwork or tags show up. Is this a limitation of the software or is it a UPnP Server issue? The file was transcoded from lossless ALAC to mp3 and downloaded to the iPhone. Does UPnP not carry the mp3 tags over or is the issue the App not reading tags in files stored in the Documents Folder? The music file plays perfectly. iOS: Version 1.0.20 appears to have gone live, it supports iOS 6.1 and up - that includes iPhone 3GS, iPhone 4 and iPod Touch 4gen. Will there be a version for Windows Phone 8.1? Windows Phone 8.1 can be upgraded to Windows 10 mobile for free. Will the ability to sync files/playlists/playback statistics/ratings with the desktop app be implemented in the final feature set? I am very interested in that too. Will the Universal App replace the Win32 version at some point? or have more of the desktop features? I would love to run a RaspberryPI Windows MiniPC with Foobar2000 as the Music Server and playback statistics synced across all devices. Universal will not replace the desktop version, they are quite different, not a one fits all design. The syncing app is undecided at the moment. I'd love to support that, but I know of no handy SMB interface libraries, other than the GPLed Samba. Is WASAPI interface available on Windows 10 mobile? It's a feature used on a lot of Android devices in this household to access music files shared from network attached storage. Neutron Music Player allows this. Most Android File Managers can access the NAS. Hopefully you can find a library that would do a lot of the work in making this feature possible. A little addendum to the reply #50. It appears now playing screen is not very accessible with a screen reader when running IOS version as well. I believe this is something that will be eventually looked into after more critical issues affecting more people will be addressed. Thanks for releasing this, it's much appreciated. 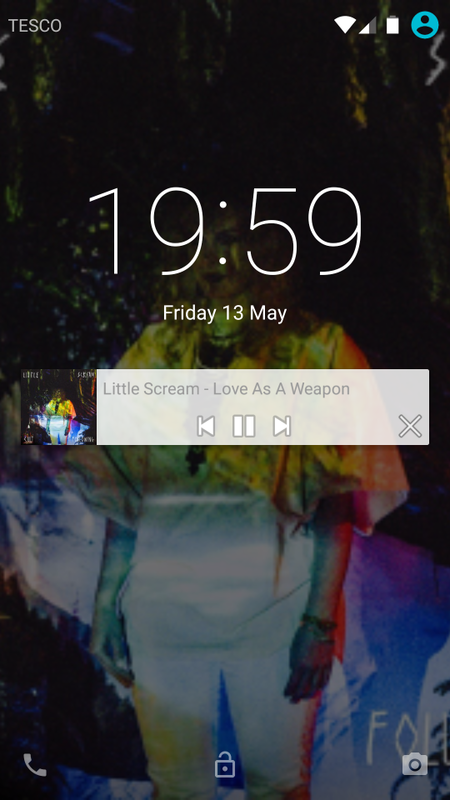 Are there plans for a lockscreen widget on Android? Perhaps the version of android matters? FWIW, I'm on lollipop 5.1.1.
edit: I do have an annoyance with the album browser which seems to be a design choice. Why is an album title like The Greatest filed under G ?? I guess you're sorting using something like $stripprefix from the desktop version and while I can understand why some users might like it for artists, it makes no sense for albums at all. I have the Kitkat version (4.4.2) of Android and there is a lock screen widget. It replaces the weather widget when foobar2000 mobile is open. My phone is a Kyocera phone it identifies itself on any Wi-Fi hotspot as HTC device. Version 1.0.21 for Android and Windows has been released on the stores. Lots of bug fixes and tweaks on Android. "Last active view" context menu bug was pretty bad, now fixed. Regarding the Android widget formatting, it's one of the things that changed in 1.0.21. Seems that audio ouput selection (XAudio/other) has disappeared or moved elsewhere ? Probably not necessary? That was removed from the free version. Windows output mode choice was removed because only thing you can do with it right now is shoot yourself in the foot by choosing a mode that is known to work badly on your platform (desktop/phone). If I get bug reports about broken audio output, I want to be 100% sure they're coming from the good configuration. Super, thanks, ticks allmost all the boxes for me. Only thing missing for me is a Linux version. Stpuid questions do not exist.